Metal frame elasticated nets are an ideal solution to provide a simple and effective way to store small items. These framed nets are particularly useful in cars, camper vans, mobile homes, boats, on shelves, walls or on the inside of cupboard doors. They can be used to store items such as phones, pens, paper, and other small items. Larger nets can be used to store items such as torches, emergency kits, clothing, small boxes and electrical items. 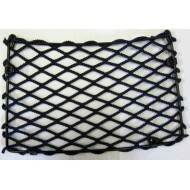 These nets are made with a powder coated black metal frame and they have a black elasticated diamond shaped mesh net which is secured with a bungee cord across the top of the net. 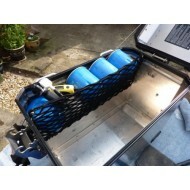 The nets are supplied with 4 fastening clips to make installation quick and easy. The elasticated nets are a very high quality and will retain their shape and elasticity even after continued use. 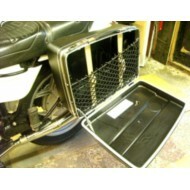 These elasticated framed nets can be custom made to ensure that they fit precisely within the area you have available. Other colours are available upon request. Metal frame elasticated nets are an ideal solution to provide a simple and effective way to create a..
Metal framed elasticated nets are a practical and simple solution for creating extra storage space w..